Lamb, chamomile, L-tryptophan & valerian root. Ethical, natural, low-calorie and award-winning. Ethical Award - The Ethical Company Organisation. No added salt or sugar. PETA - not tested on animals. Calm & Relaxed includes lamb, chamomile, l-tryptophan and valerian root. Chamomile and valerian root were both traditionally used in ancient Greece, Egypt and beyond to aid relaxation. L-tryptophan is essential to form serotonin, the 'feel good' neurotransmitter. 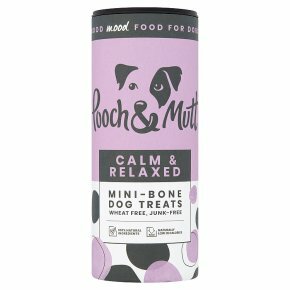 Give these treats to your dog before stressful situations such as visit to the vets, car journey, fireworks, competitions, separation or just as a nice bedtime treat.